Theodore Judah laid out the route of the transcontinental railroad over Donner Summit. He noted that it snowed and so he studied the moss on the trees. He was sure snow would not be a problem for the railroad over Donner Summit. The snow just had to be pushed out of the way before it accumulated. Donner Summit gets 35-40 feet of snow a year and sometimes 60 or 70 feet. Snow drifts can be dozens of feet high. And then there are avalanches. 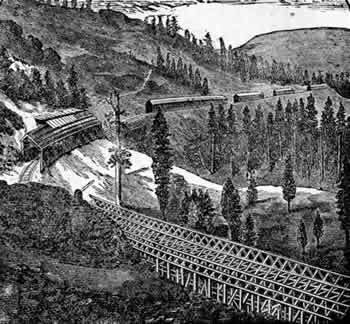 In January, 1870, just a few months after the Golden Spike was pounded into place completing the first transcontinental railroad, an avalanche covered and tore away hundreds of feet of track. A blizzard followed. Miles of track were blocked and it kept snowing. The snow shovelers and buckers (engines with plows) could not make headway. Workers cleared for six days and still there were 7 miles of snow covered track to go. California was cut off from the nation. Passengers were irate as train after train was stopped. After six days the railroad took stranded passengers up to the snowblocked tracks and told them to walk. Without proper clothing they walked through the snow past small stations with their telegraphers and railroad facilities, and through tunnels all the way to Emigrant Gap. 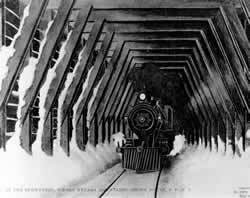 After that winter the Central Pacific built more snowsheds, forty miles of snowsheds, to protect their tracks. They used 65 million board feet of lumber and 900 tons of bolts and spikes. thousands of workers: fire train crews, track walkers, fire lookouts, carpenters, and snow shovelers. There were so many workers some lived in old freight cars all along the railroad line. 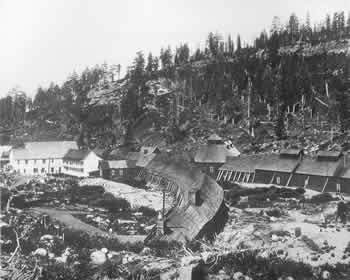 Railroad shops, buildings, turn tables, local businesses, worker houses, and even the school and hotel on Donner Summit were connected by snowsheds. In winter some people would never see the light of day. 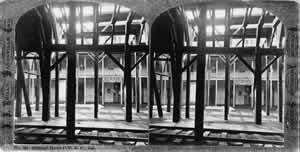 Below left is a stereopticon view of the Summit Hotel through the snowsheds. Right (or below if you are using a smaller screen) is the Donner Summit snowshed complex with the Summit Hotel, the white building, to the left. The large building in the center with the cupola, is the covered turn table. Below shows the view throgh the snowsheds to the front door of the Summit Hotel. The snowsheds worked. The railroad had conquered the snows of Donner Summit - usually. Passengers were not thrilled however. Imagine traveling past some of the most beautiful scenery in the world, but you could not see it. Imagine traveling for hours through a long, dark, smoke-filled tunnel. "Snow is not a problem over the Sierra Summit. "It will be necessary only to start an engine with snowplows from the summit ... at the commencement of a storm, clearing the snow as it falls... [it] will keep the track open during the entire winter.""